An attend lobby is the service of a lobby attendant or concierge in which the attendant welcomes and check-ins guests, maintain security, and receive any delivery services. Situated at the entrance in the lobby, lobby attendants/concierge are typically seated behind a desk. Several building types offer lobby attendant/concierge at various price points. 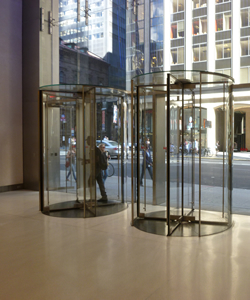 A full-service building usually has both a lobby attendant and a doorman which are generally pricier. Then there are some building with no doorman or lobby attendant. These terms are often assumed to be synonyms of each other. Albeit, both are present in the lobby, they service the building differently. A doorman is a uniformed individual who helps staff, clients, and visitors through the door and into the building. An attended lobby, on the other hand, has an attendant/concierge behind a desk in the lobby who can welcome and manage visitors and guests. 1) A full service lobby typically assigns more than one employee to service the lobby. A doorman and concierge desk are available in the lobby. 3) A virtual doorman is in the lobby and uses cameras with an internet connection to transmit images to the monitoring center. A virtual doorman allows tenants to see and talk to anyone at the door with only the doorman being heard. 4) The unattended lobby does not assign any persons/employees to be present in the lobby. Instead, a voice or video intercom system is installed in the lobby. A perceived level of safety is a fruitless argument because it is something you either ‘feel’ or don’t. An attending lobby is a great amenity that can make a difference in safety for a business. Attended lobby can offer security to tenants with the presence of a person at the door. The notion of security can be a vague value. If your concerns lie with whether the attendant can see the sidewalk, whether the block active or not, and even the activity in the neighboring buildings, then the security offered by a lobby attendant may seem more uncertain. On the other hand, the value privacy may contribute to the security offered by a lobby attendant. If a privacy is important, then having a person at the door monitoring the coming and goings of yourself and staff, may pose more of a concern. The people who may feel this way most likely view an attended lobby as a con despite the price. These people tend to prefer the downtown location rather than Midtown. Class A buildings are considered to be the best of the best commercial buildings offered on the market. Class A buildings consist of mainly prestigious buildings with above-standard finishes, state-of-the-art technology systems, prime neighborhood locations, and renowned architecture. Class A buildings attract above average rent due to the exceptional amenities and location. High-tech security, modern elevator, high-end HVAC, and technological availabilities are stunning features placed throughout the building. In-building services may also include cafes, restaurants, retail, gyms, roof terraces, balconies, and bike storage. The buildings employ concierge/lobby attendants to service the stunning lobby. Class A office space is perfect for an image conscious client or business looking to impress. Class B building tend to be older and outdated in comparison to Class A buildings. The buildings tend to offer run-of-the-mill office space. The technological capacity is usually good but rarely great. Offering average range for rents in the comparable market, they are typically nice and functional, but not nearly as impressive. Even with the seemingly commonplace description, Class B buildings boast modernizations and improvements to offer the tenants. The maintenance, elevator systems, and HVAC are all practical and a great bang for your buck. 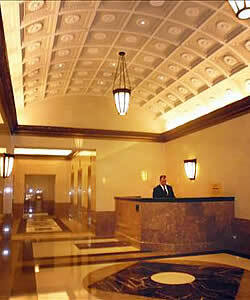 Class B buildings tend to have attractive lobbies with lovely finishes, but not as high-end as the Class A buildings. Several of the Class B buildings may even have an attended lobby, security staff, or management present, possibly during or after business hours. Class C buildings attract tenants looking for office space with below average rent in a good location. The below market rent is not without its compromise; the buildings may have subpar maintenance and out-of-date finishes. Older buildings in need of modernizations and renovations frequently fall into this classification. The technological capacity usually is outdated and feeble. The elevator system most likely original or non-existent. Generally functional and serviceable, the services are typically outdated in comparison to the Class A or B building services. The buildings pass on the “power lobby” and opt for an entrance with an intercom instead. Without the large lobby, a lobby attendant/concierge is rarely employed in Class C buildings. Class C buildings are a great economical choice for a no-frills tenants. An attended lobby differs in service and prestige offered to each tenant or business. Understandably the A, B, C classification for the buildings remind us high school assignments, but unlike high school you do not have to stress about attaining the “A” office space. Bear in mind, the classifications of buildings compete for different kinds of tenants and are mostly subjective. If your interested in a building that features an attended lobby, just give us a call - we can delivery to you a space survey detailing only those buildings that match your specific needs.